People have been collecting sports memorabalia since the early 20th century when improved communications turned organized athletics into mass entertainment. Athletes went from being local heroes to international celebrities, leaving a trail of mementoes and products in their wake. Pictured right: The T206 Honus Wagner baseball card – The Holy Grail of Baseball Card Collecting and the nost valuable ever selling for $2.8 million in September 2007. Indisputably, baseball is the most widely collected of all sports, with baseball cards being the most active area. The first baseball cards were printed late in the 19th century by tobacco companies, such as American Tobacco Co., and were distributed with the company products as a bonus. During the 1920’s, candy companies entered the fray with their own versions of cards. 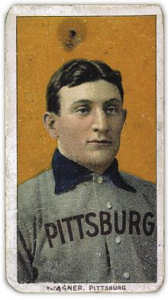 Rare cards can sell for many thousands of dollars and the rarest of all the T206 Honus Wagner card for nearly $3 million. A simple search on ‘baseball cards‘ on ebay can produce over 100,000 entries. There are many other popular areas of baseball collecting – pennants, posters, signed balls and bats, jerseys, and so on. American football runs a close second to baseball in terms of collecting. Football cards have been printed since the 1890’s, but the release of the first bubble gum football card in the Goudey Sports King set of 1933 really got the ball rolling, as it were. 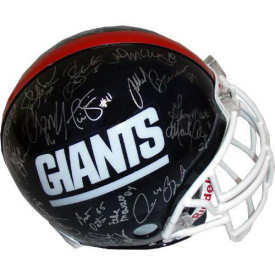 Although not as expensive as baseball cards, football cards can also sell for thousands, as can football related paraphenalia. Football (soccer, to North Americans) is also a hot area for collecting, particularly with the phenomenal success of 2002’s World Cup series. Jersies are a premium item and shirts worn by star players sell for thousands and thousands of pounds. Golf is another sport that is widely collected and this market is exploding. Manufacturers used to put a puppy or a baby on a product if they wanted it to sell – now, they simply add something golf related. Of course, the game of golf is an ancient and honorable sport that developed in Scotland. Pictured right: Painting of Tiger Woods 2005 by Campbell, Craig. 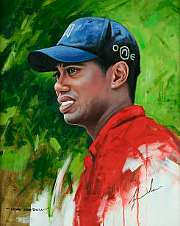 Aan original acrylic on board portrait of Tiger Woods painted in 2005, a year in which he won two more Major Championships, signed by the artist. 28 x 17 inches. – sold for £3,000 at Bonhams in 2006 – image Copyright Bonhams. The first record of golf appears in an unlikely place, Gloucester Cathedral, which was dedicated in 1100 and is famous for its stained glass windows. A window erected in the east wing of the Cathedral was commissioned by Sir Thomas Broadstone to commemorate his comrades who fell fighting the French at Cre’cy and is dated about 1340. This was 60 years before the first written reference to golf appears. Apparently one of Sir Thomas’s men was an avid golfer and was immortalized mid-swing. Areas of collecting include vintage clubs, golf balls, celebrity golfers’ autographs, decanters, mugs, etc. Fishing items have also become highly collectible. Vintage lures, reels and rods sell for high prices, as does artwork depicting the sport. 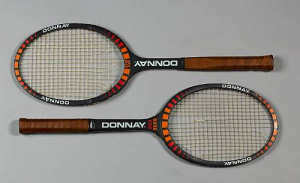 Pictured left: Bjorn Borg’s Donnay Pro “Personal Model” tennis racket from either the 1980 or 1981 Wimbledon final – sold for £5,500 at Bonhams in 2006 – image Copyright Bonhams. Other sports of burgeoning interest are tennis tennis, boxing, motor racing and ice hockey, both of which feature a wide variety of collectible items. The fact is that there are as many different collections are there are sports, from bowling to curling, from skateboarding to skiing. If an organized sport exists, there will be collectors who treasure its souvenirs.